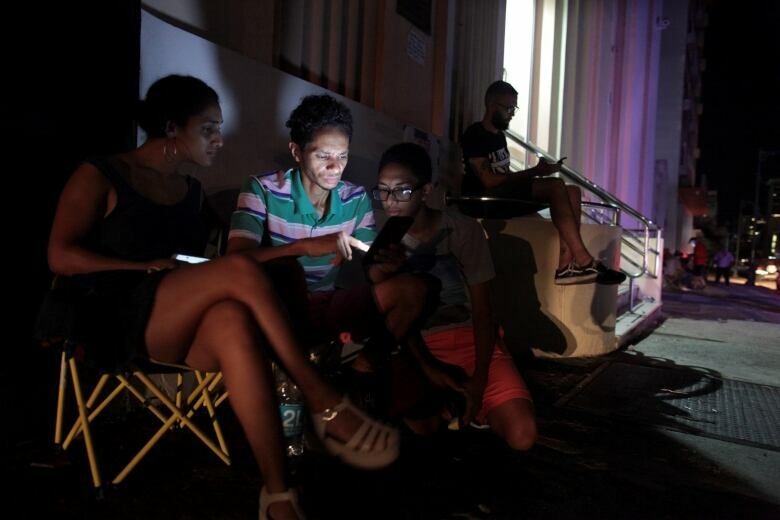 A voter registration drive in hotly contested Florida has signed up thousands of Puerto Ricans, as organizers — and the Democratic Party — hope anger over the Trump administration's response to Hurricane Maria translates into votes in the midterms. Tens of thousands of people fled the island and settled in Florida since last September's devastating storm, joining what was already a huge Puerto Rican community in the southernmost state. It's a community that holds a great deal of anger over what many view as the U.S. government's inadequate response during their island's time of need. For some, November's midterms represent payback time. "One sentiment that gets more people to the polls than anything else is anger," says Jose Calderon, president of the Hispanic Federation in New York, a group that surveys attitudes within the Puerto Rican community. He says his surveys show Puerto Ricans in Florida are motivated to vote and "know very clearly what [Trump] failed to do on their behalf, and the way he was so dismissive of the people of Puerto Rico and the island." "I think Puerto Ricans will make a difference in November," he says. 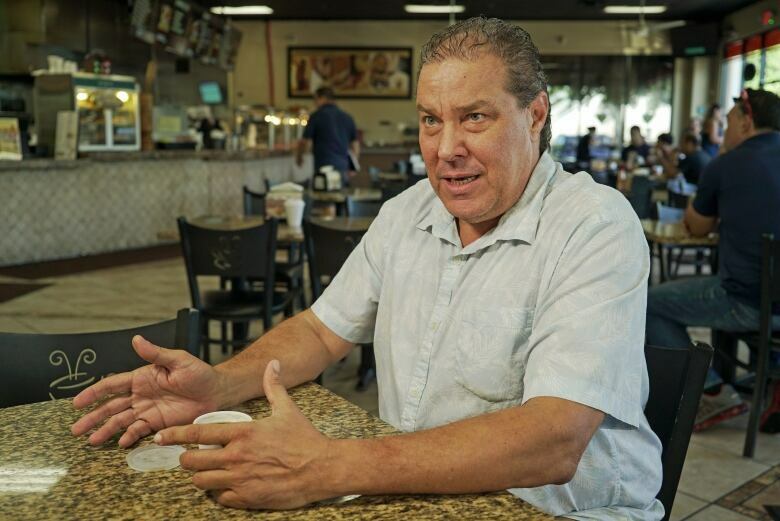 In a busy café not far from his new home in Kissimmee, south of Orlando, Ricardo Lockwood sips a black coffee and thinks back to Maria and its aftermath, which crippled the island's infrastructure and led to the deaths of hundreds of people. He focuses on the scenes of devastation, but if there's another image from those terrible days that he can't shake, it's of Donald Trump. Under pressure to boost federal aid to Puerto Rico, the U.S. president visited the island a few weeks after the storm. 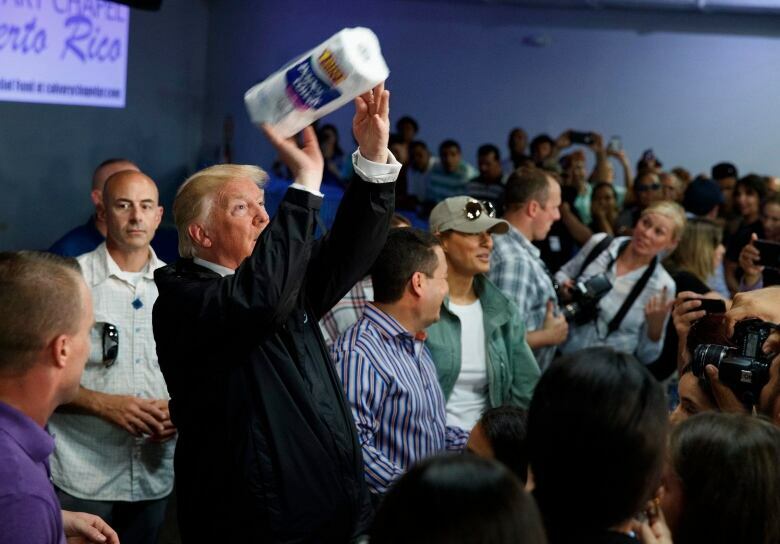 As the trip neared its end, Trump stood before a large crowd of Puerto Ricans who were desperate for massive amounts of help — and tossed rolls of paper towel into the crowd. "It was inhumane," Lockwood says. "He treated us indifferently. He showed us his racism." The Trump administration was fiercely criticized for being slow off the mark with its emergency response and falling short overall. The paper towel episode seemed to symbolize that perceived failure. 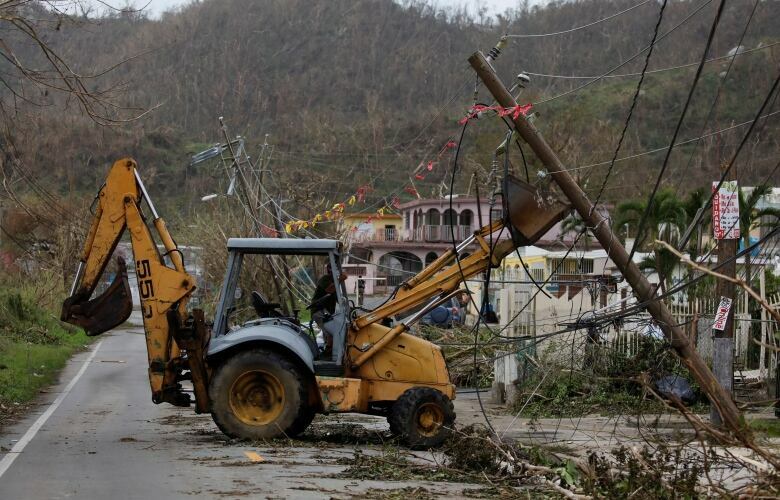 Ultimately, many billions of dollars in federal aid were pledged to the American territory, but many on the island said the damage far exceeded the amount promised. Although Puerto Ricans are American citizens, they cannot vote for Congress or for president while living on the island. But voting-age Puerto Ricans like Lockwood who move to the mainland become eligible to cast ballots as soon as their feet touch the ground. All they have to do is register. Outside the Unidos Grocery store in Kissimmee, volunteers with the group Mi Familia Vota (My Family Votes) stop shoppers in the parking lot. Clipboards in hand, they ask in Spanish: "Are you registered to vote?" If the answer is no, they arrange it on the spot. In a state where elections are historically closely contested, where even a small number of ballots cast can make a difference, the volunteers had signed up 21,240 new voters in four counties in central Florida by mid-August — more than half of them Puerto Ricans. Across town, inside another grocery store, volunteers with the group Boricua Vota, which promotes Puerto Rican engagement in U.S. elections, staged its own voter drive. Banging drums and parading amid bemused shoppers who danced alongside them, they sang in Spanish: "Don't stay home come election day. Don't let them take your vote away." 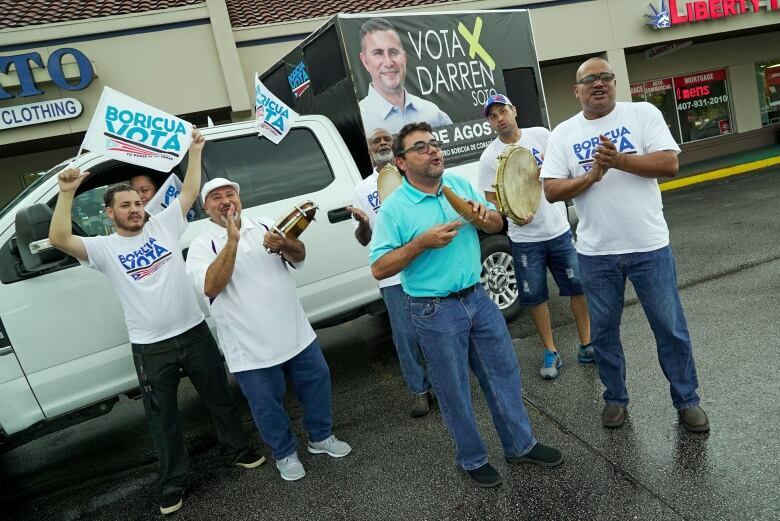 Trump isn't on the ballot in the midterms, but Boricua Vota's Jimmy Torres, who led the band through the store, emphasizes that the president's party sure is. "This is the first opportunity … after Maria to really make sure that people in this state — the people who can — vote for Congress," he says. "We can send a clear message to the Republican Party that what they did to Puerto Rico was not acceptable." But will Puerto Ricans turn out come November? Ever since last year's exodus from the island, Democrats have wondered whether their frustration with the Trump administration's response to Maria would actually translate into votes. Many expected a stronger turnout from Hispanics broadly in the 2016 presidential election, given Trump's campaign calls to curtail Mexican migration and build a border wall. But it didn't turn out that way. Data from the U.S. Census Bureau after the election showed voter turnout by Hispanics across the country was less than 50 per cent. Instead of an expected upsurge, it declined slightly (0.4 per cent) compared with the 2012 election. Still, it is clear politicians of all stripes in Florida are keenly aware of the potential power of Puerto Rican voters in these midterms. Last month in Orlando, Puerto Ricans staged a raucous event they called "political salsa" at a downtown conference centre. It was aimed at bringing together politicians and Puerto Rican voters in a kind of festive meet-and-greet. Amid Stars and Stripes balloons, blaring music and even a Donald Trump impersonator, voters mingled with Republican and Democratic candidates and pressed them on various issues. Among the high-powered candidates who turned out was Florida Gov. Rick Scott. He's a Republican but gets credit from many Puerto Ricans for helping those who fled the island get themselves settled in Florida. Scott is now in a tight race for the U.S. Senate, and makes a point on the campaign trail to emphasize his work in helping newly arrived Puerto Ricans. But not far away from him at the event was Democratic Congressman Darren Soto, determined to link Scott and other Republicans with what played out last year in Puerto Rico. "It's our job to make sure the Puerto Rican community understands Republicans are supporting Trump, who was disastrous for the island," Soto says. "That message needs to be crystal clear." Back at the grocery store with that marching band, Torres works to spread the same message. "As President Obama used to say, 'Don't boo — vote!'"